I watched my son (in loose shoes) run hard to the basket for a right handed layup. he planted left foot and it twisted (or he jumped and came down on it we cant remember). 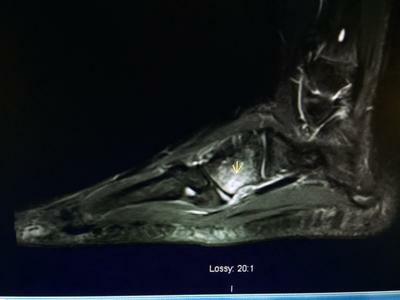 non weight bearing due to pain at proximal 5th metatarsal and cuboid. xrays 2 days out on the foot and ankle are normal. got MRI foot/ankle one week out. I am an ER physician assistant and have a podiatrist friend. 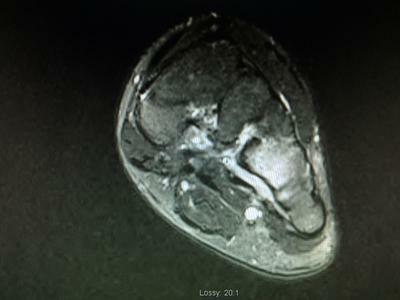 He ordered an MRI which showed a probable contusion of the cuboid ("diffuse marrow edema of the plantar third of the cuboid with out discrete cortical disruption) there was also "wispy marrow edema in the plantar aspect of the navicular possibly related to contusion verses reactive changes". he is in boot and crutches. missing the start of basketball. 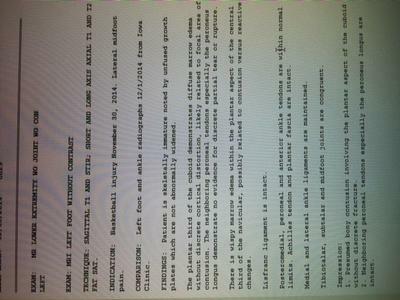 Wondering if he really does has a stress fracture and i should have asked for a CT scan or a bone scan? he still is point tender over the cuboid. I don't want him to have a messed up foot. I want to treat this correctly. His podiatrist is very good, but should he have had a CT or bone scan? would they be of any benefit at this point? to be in the boot for a longer period of time. Having said all that, the one potential issue is that of a subluxed (dislocated) cuboid which is very difficult to diagnose with almost all the tests available. A CT scan is probably the best test for this condition. But, again, the treatment would be immobilization, with the possibility of some manipulation of the cuboid to make sure it is in proper position. You mention that your son is in a boot with crutches. I do not know if he is using the crutches for partial weightbearing or he is using the crutches for total nonweightbearing. In an effort to get him better as quickly as possible, I would recommend he go totally nonweightbearing, for two reasons. The less stress he places on the foot, the quicker the bones in question will heal and secondly, some of the cam walkers out there tend to be too narrow in the mid portion of the foot and walking on them can actually exacerbate the problem rather than help, so by going nonweightbearing you remove that possibility. Beyond that, unfortunately, you have to wait it out. What you might consider doing is at every two week interval press around the navicular and cuboid bones and ask your son if there is any tenderness. Try and measure the degree of tenderness. In an ideal situation there should be dramatic improvement on a two week basis especially in a young person. If for some reason, the level of improvement fails to meet your level of expectation, then that would be a cause for concern and further testing might be appropriate.